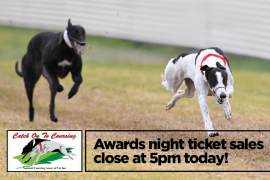 The Shepparton Greyhound Racing Club and Shepparton Branch of the Blue Ribbon Foundation have joined forces to re-introduce the Blue Ribbon Foundation race meeting to be held on Monday night 26th September. The Blue Ribbon Foundation race meeting is aimed at raising funds for the charity that perpetuates the memory of members of the Victorian Police Force that have been killed in the line of duty. The special race rug to be worn tonight. The greyhound in Race 11 Box 4 at Shepparton’s Blue Ribbon Foundation race meeting on Monday night is Above The Law. With a win and two thirds amond his past four starts, punters may consider the $12.00 chance good value.